Christmas is coming, and with it the rounds of parties, drinks receptions and visiting friends and family who undoubtedly arrive thirsty. This festive season don’t be caught out and end up having to dash out to the garage or corner shop to buy drinks for visitors; create your Christmas Cocktail Cabinet now and it’ll serve you and your guests well this year, and probably next year and the year after too. A thoughtfully stocked cocktail cabinet or drinks trolley needn’t cost a great deal, and you can replenish or upgrade elements of it over time. It is an investment, and a work-in-progress. 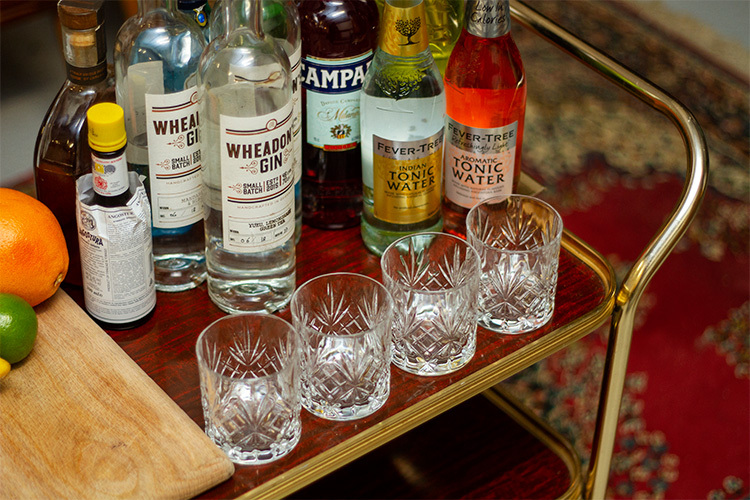 Here at Wheadon’s Gin, we believe that being able to serve your guests great gin and tonics or classic cocktails is the key to a great Christmas party. Here’s how we’d suggest you stock your home bar this year. Stock your bar with good basics as these form the foundations for all of the drinks that you’ll be serving. Gin is the starting point for so many great cocktails, and we’d recommend being prepared for a few classics so that you can offer a “menu” as your guests are taking their coats off. It goes without saying that at least one bottle of Wheadon’s Gin is a must, but if you’re planning on mixing martinis (certainly not shaking them) then a bottle of more juniper-forward gin such as 6 O-Clock or The Botanist would be great. For those with questionable taste who desire something other than gin, a bottle of vodka and a bottle of bourbon will cover most bases. On this note, it’s better to get smaller bottles of good products for these secondary bottles, than full-size bottles of cheaper spirits, and upsize if you need to. And lots of it! Whether you buy it in bags or make it in trays in your freezer, a lack of ice can make a good drink bad very quickly. Ideally, if you’re entertaining lots of people, you can have it to hand in an insulated ice bucket rather than having to keep open and close the freezer door. Tonic for all of those Wheadon’s and tonics that your guests will be demanding – we’d suggest fever tree premium Indian tonic water and aromatic tonic water in small bottles (so that you don’t have a large bottle losing its fizz). We’d also suggest ginger ale as an alternative mixer for Wheadon’s Gin yuzu, lemongrass and green tea, and possibly some soda water. If you have a bottle of our mandarin lime and hibiscus gin then a bottle of Campari and a bottle of sweet Vermouth Rosso will allow you to mix exceptional (and simple) negronis as an aperitif, and a bottle of dry vermouth will come in handy for any martini fans in your ranks. Lime cordial (Roses, of course) for gimlets, and a small bottle of aromatic bitters (such as the yellow capped classic Angostura) will go a long way. Some recipes call for a simple syrup (made by heating equal parts sugar and water until combined and reduced, then allowed to cool) that can be made in advance and kept in the fridge between parties. Fresh citrus is a must, be it to garnish G&Ts or cocktails; lime, lemon, orange and if possible, a pink grapefruit. You can carry more (olives in brine, maraschino cherries, etc…) but it’s not at all essential. 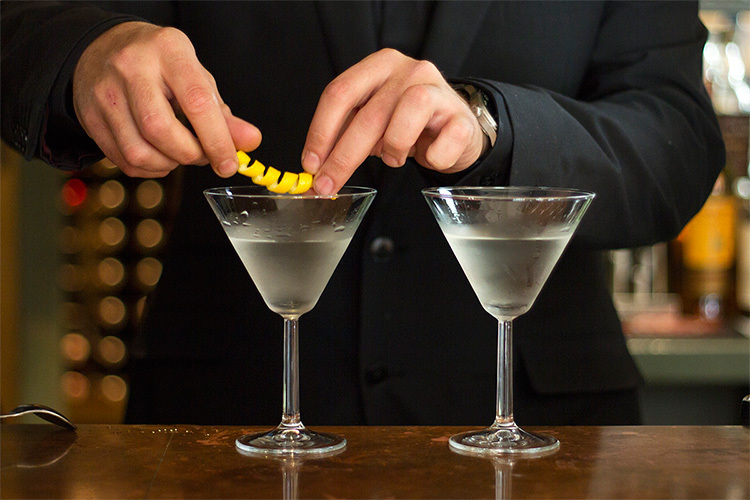 A jigger or set of measures will allow you to make consistent drinks and not serve up weak or overly strong cocktails. A citrus juicer and a sharp knife and a peeler will be handy for dealing with fruit (juices or garnishes), with a chopping board to cut on. A fine strainer and a hawthorn strainer will also be useful for serving some cocktails. You don’t definitely need a Boston glass and tin or cocktail shaker (you can just use a sealed container such as a mason jar), but it’ll help your bar and you to look the part. Finally, a muddler and a bar spoon will round out your hardware requirements if you’re going all in. You can buy complete kits or individual pieces quite reasonably, so if you see yourself being a customer at your own bar once the festive season is over, or hosting more parties next year, then you might consider these a worthwhile investment. You don’t want to go to all of this effort and then end up having your guests drinking out of an odd assortment or water tumblers or, forbid the thought, mugs. Wine glasses are perfect for Wheadon’s and tonics, unless you want to invest in more than just a couple of copa de balon G&T glasses. 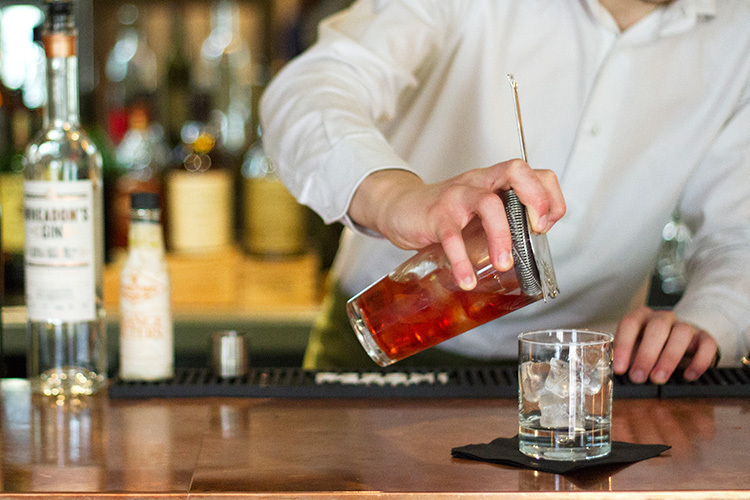 A set of rocks or old-fashioned glasses is great for negronis or for your whisky drinkers, and high-ball glasses are versatile and suitable for any long drink. Finally, a set of coupe glasses (Champagne saucers) can double perfectly well when you’re looking to serve a martini or gimlet in the appropriate vessel. 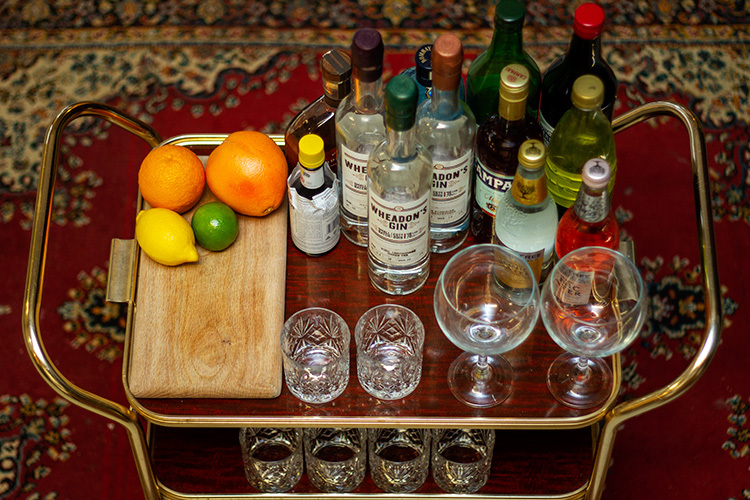 We would suggest starting small, and developing your cocktail cabinet or drinks trolley as required over time. Acquaint yourself with a handful of standard, simple, cocktails (you can find some of our suggestions here) to offer guests on arrival, and you’re sure to impress. Both your selection of drinks and your cocktail armoury will grow over time. And if you don’t fancy spending all night mixing drinks, you could always get a punch bowl and make a big bowl of Wheadon’s Christmas punch for your guests to help themselves to. Whatever you do though, we hope that you have a bottle of Wheadon’s to hand, and a very enjoyable time. 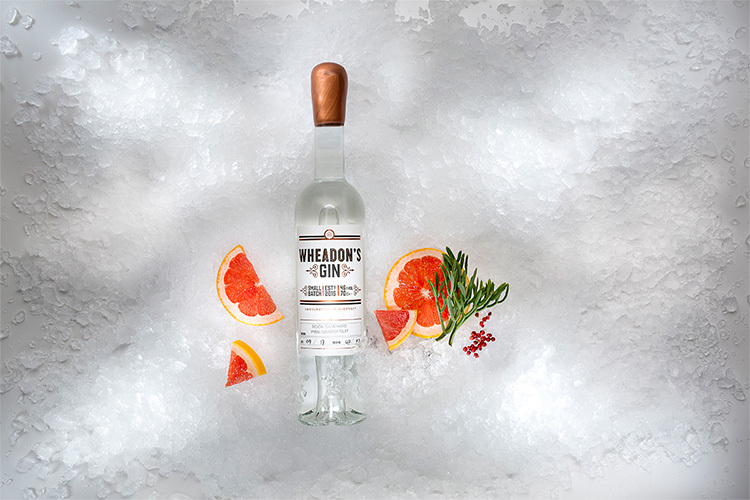 Find your nearest Wheadon's Gin stockist or online retailer here.